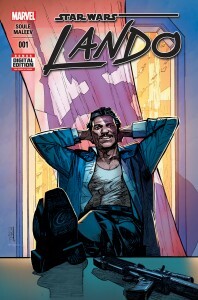 Marvel Expands The STAR WARS™ Universe With LANDO #1 This July. You know him. You love him. Prepare to see a side of him you’ve never seen before as the galaxy’s smoothest gambler, entrepreneur, and smuggler gets his very own series! Today, Marvel Entertainment and Lucasfillm Ltd. are pleased to announce LANDO #1 – a brand new Star Wars limited series coming this July from Marvel Comics! Join Lando on his greatest caper ever as blockbuster creators Charles Soule (Death of Wolverine, Inhuman, She-Hulk) and Alex Maleev (Daredevil, Spider-Woman, Moon Knight) bring you a new tale of a scoundrel in his natural element – trouble! “Is Lando Calrissian the coolest character in all of Star Wars? Depends on who you ask, probably. But if you ask me, the answer is yes, and I plan to prove it with this story,” says series writer Charles Soule. Before he joined the rebellion, before he oversaw mining operations on Bespin – he was just Lando. Making his way in the galaxy and getting by on good looks, charm, and an ace up his sleeve (sometimes literally). With his cyborg aide Lobot at his side, Lando has plans to steal one of the galaxy’s most valuable ships. Yet even with his swindles and unparalleled swagger – has he bitten off more than he can chew? Created in close partnership with Lucasfilm, this new Marvel Comics limited series will exist as part of the canon for the Star Wars universe! Once again, Marvel brings the biggest creators in the industry to the biggest characters in a galaxy far, far away. Be there when the Star Wars line expands this July in LANDO #1! For more on Marvel Comics’ Star Wars please visit Marvel.com and join in the conversation on Twitter with #StarWars. To experience Star Wars online, visit StarWars.com or follow Star Wars on Facebook, Tumblr, Twitter, Instagram, Google+ or YouTube.